Welcome to College Hill! Thanks for your interest in our neighborhood. Our neighborhood association of residents and property owners is committed to improving the quality of life and historic character of College Hill. If we can answer any questions about the neighborhood or the historic district, please let us know. Homes in College Hill and the city’s two other historic districts are under all the same regulations as homes in the rest of the city. For example, no more than four unrelated individuals can occupy a single residential unit, and parking is prohibited in front yards. 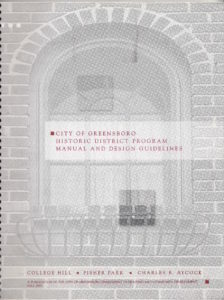 In addition, exterior renovations must comply with the city’s Historic District Manual and Design Guidelines. Before work can begin, most projects require a certificate of appropriateness approved by the city historic preservation staff (for small-scale and routine projects) or the Historic Preservation Commission, which meets monthly. 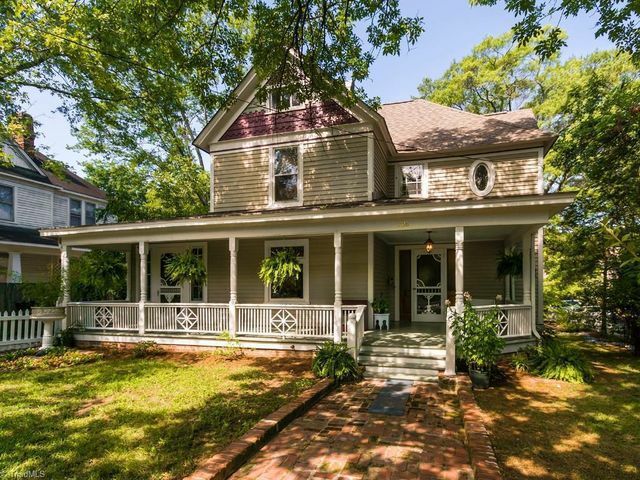 To maintain the historic character of College Hill and Greensboro’s two other historic districts, the guidelines rule out some relatively modern exterior renovations that are taken for granted in other neighborhoods. For example, the replacement of wood siding or exterior doors with aluminum or vinyl is considered inappropriate for homes in the historic districts. In addition, the division of single-family houses into apartments is not allowed. The historic designation of College Hill in 1980 has increased property values greatly. The neighborhood has improved dramatically in every way thanks to the commitment of property owners and the city to maintain College Hill’s historic character. We look forward to new neighbors joining us.